I have shared a simple falafel recipe before and that one is great, especially for those who do not like onion. This is a slightly modified version, which is my favorite. It is absolutely delicious as the falafel comes out slightly lighter than the previous version because of the onion. 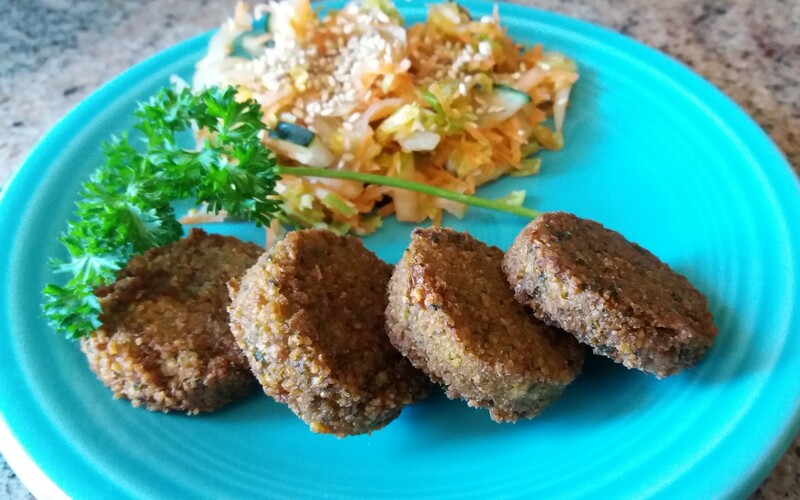 Falafel is a Mediterranean classic and will be a hit with your family! Thoroughly drain the chickpeas. Place the beans and onion in a food processor and pulse for about 30 seconds. Add the garlic, cilantro, parsley, cumin, red pepper flakes and salt. Pulse for another 30 seconds or until evenly processed. It should be blended, but not pureed. Add the baking powder and flour and pulse again so it is evenly mixed in. A dough should form into a small ball without sticking to your hands. It is best to cover the bowl and refrigerate for a few hours. Using a deep pot or saucepan (I like a cast iron pot), fill it with 2 to 3 inches of oil. You want enough oil such that a falafel ball will sink and fully emerge itself in the oil and then have space to rise to the top. Heat the oil to about 375F. You will know you have the right temperature when you drop a little batter into the oil and it sinks to the bottom then immediately rises to the top. Shape the bean mixture into little balls, pressing firmly toward the center and smoothing the edges out by rolling them around in your hand. Alternatively, you may use a falafel scoop maker. Drop a few balls at a time into the oil being sure not to crowd too many in there at once. Fry in batches until nicely browned, 3 to 5 minutes. Delicious when served with hummus. Enjoy!